A home sleep test uses a small respiratory monitor, which is worn overnight to record heart rate, brain wave activity, respiratory effort, airflow, oxygenation and sleep position. There are less leads attached to you than with the laboratory sleep study to make the process simpler and more comfortable. If you have insufficient insurance for an in-hospital stay or a very strong preference for a home test, this can be organised through our offices. Your GP is also able to request home sleep tests (without sending you to us for a consultation), as long as an adequate referral has been received by our office to ensure that the testing is appropriate for you. In this case, results are sent to your referring doctor two weeks after testing, and a follow-up appointment with one of our physicians can be organised if required. We perform home sleep testing through our affiliate, National Sleep Diagnostics, present in most states and territories including regional centres. 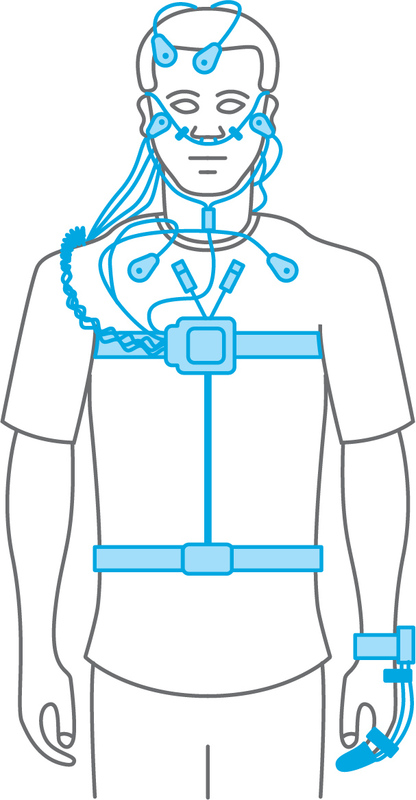 On the day of your home sleep study, we ask that you come to our offices at approximately 4:30pm, wearing a t-shirt/singlet that you are comfortable to sleep in, over which the equipment is partially fitted. You then put on the remaining equipment as you prepare for sleep that night and remove the equipment in the morning before returning it to our office or the testing agent.